The intent of this drill is to teach first baseman to quickly get to first base on a ground ball, position for a throw and perform required footwork in relationship to the throw. (e.) The first baseman adjusts his angle to face the fielder and adjusts his footwork, as the throws should be made to his left and right, forcing him to move to the ball, yet remain in contact with the base. II. The Coach then moves to the shortstop side of second base, positions himself halfway between the pitching mound and the shortstop position, repeating the drill. III. The Coach moves to the pitching mound in line with 3rd base and repeats the drill. 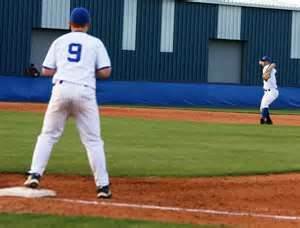 It’s important to note the Coach is stationed closer to first base than the normal fielding position, which reduces the first baseman’s reaction time to the throw, which helps in the teaching of having quick hands and feet. 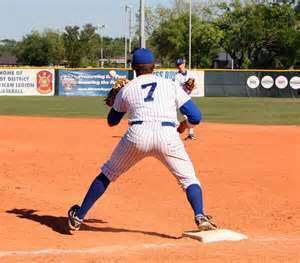 The intent of this drill is to teach the first baseman how to dig balls out of the dirt and remain in contact with the base. After instructing the players on altering foot movements in order to adjust to the side the ball is thrown, maintaining an open faced glove, reading short hops and etc. there’s only one way to practice digging balls out of the dirt … Field Them. Utilize the exact criteria used in the first drill, except the Coach throws the balls into the dirt instead of making accurate throws. Throw from different angles, changing the speed, type and location of the short hops, and be sure to mix in good throws and a few high throws in order to stop the fielders from cheating. Keep them guessing, but remember the intent of the drill is “Digging” the ball, so 98% of the throws should be in the dirt. The intent of this drill is multi-fold; turning double plays, quickly deciding when not to attempt to turn a double play, with a runner on first base, and making better than average plays. (a.) Should a fielder slightly bobble or not cleanly field or transfer the ball, he must instantly decide whether to attempt the double play or get the 1 sure out. (4.) Intentionally hit ground balls at different speeds to all infielders. (b.) or decide if a hard hit ball, although not 100% cleanly fielded, still allows the ability of turning two. (5.) You may intensify the elements of the drill by pre-determining the situation, such as calling a slow runner on first vs. a fast runner, which totally changes the aspects of whether to attempt the DP or not. You’ll hear coaches telling players to use “soft hands,” but what exactly does that mean. In essence it’s the developed ability to cradle a baseball with the grip and motion used to field the baseball, which absorbs the energy shock of the ball moving forward, then suddenly stopping. Instead of hitting the hands (glove) and bouncing backwards out of the glove, the ball hits an object (hands/glove) which cushions the impact and redirects the energy preventing it from bouncing backwards. 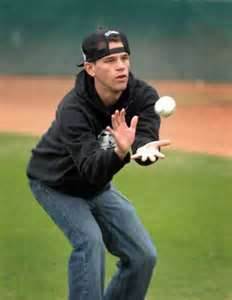 Infielders are taught as they field the ground ball, they bring their hands upward towards their stomach, from where they begin their throw or crow hop to throw. This fluid motion redirects the energy then stops it totally. Ready for a unique method to develop soft hands in your players? Have the players practice tossing and catching a raw egg. That’s right … a raw egg. (a.) Number one, eggs are actually stronger than most imagine, so don’t think just firmly gripping an egg will break it, because it won’t. (b.) However, obviously they will break if mishandled or struck too hard, but this is why the drill is so great and fun, as there’s no doubt about if they break or not. (2.) Be sure to demonstrate the wrong method of reaching and grabbing at the ball (egg) which will produce a shattered egg. It may be a little messy, but the impact on the players will be enormous as they see the egg can be safely caught if they do it right. We’ve taught our players how to quickly decide whether or not to attempt a double play on a particular ground ball, and greatly increased their chances of making a clean play by teaching them how to develop and use soft hands, but we’re still not nearly finished. 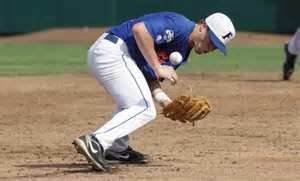 Players, shortstops and second basemen, especially those who are just now entering the skill realm of attempting to make double plays, have a tendency to catch the thrown ball one handed, then transfer the ball and throw. We know anything which slows the mechanics of turning a double play is not good, and ball transfer from glove to grip is a real time killer. (6.) Reverse the play rolling the ball to the second baseman, who tosses to the shortstop, who throws to first base. Oh, I forgot to mention neither the shortstop or the second baseman are allowed to wear their fielding gloves; they perform the entire drill Bare Handed. 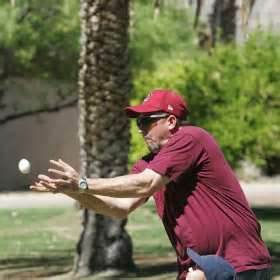 Although not impossible, it’s extremely difficult to catch a baseball with 1 bare hand, especially when moving. Therefore, the player is forced to catch the ball with both hands, which eliminates any extra time with transferring the ball from glove, to grip, to throw. Run this drill as often as required until the fielder, unless it’s an attempt to catch an errant throw, will never contemplate using one hand again.